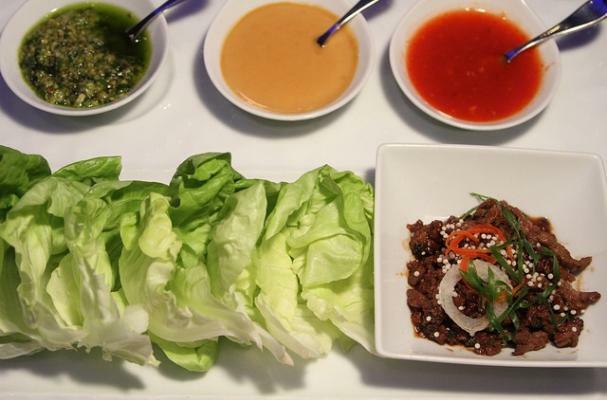 Thai turkey lettuce wraps are a tantalizing Southeast Asian dish. Ground turkey is seasoned with soy sauce, ginger and garlic. Minced carrots and mushrooms are also cooked with the mixture. These Thai lettuce wraps are a low-carb meal or an easy appetizer. 6 inches washed full iceberg lettuce leaves. Wash carefully and wrap paper towels. if you want your dipping sauce spicier add some red pepper flakes or hot sauce. Combine the ingredients in the dipping sauce and set aside. Combine the raw turkey, garlic, soy sauce and sugar in a bowl & mix. Heat a large heavy skillet or wok on medium-high and add 2 t. canola oil. Cook the turkey, once it appears all cooked and the liquid that has come out of the meat, turn it down to medium. You will continue to cook the turkey mix constantly stirring the meat and breaking it into fine crumbles. You will notice all the liquid in the pan is gone and start to see some carmelization on the turkey and garlic, this is good, it adds a ton of flavor. Now taste the meat. If the balance is too sweet, add a little more soy sauce or if it is to heavy on the soy, sprinkle with some sugar. You can keep doing this until it taste right. The turkey will be a dark brown color. Then add your diced mushrooms and carrots and cook for another 2-3 minutes more. Take your crisp lettuce leaves and fill will a large serving spoonful of the turkey mixture, sprinkle with some green onion and add some cucumber slices. Pour some of the dipping sauce over the combo, fold and eat. 1/2 of what cups lbs, tbsps? for the mushrooms.